Part 2 of 2. For pt. 1, go here. Well, it must have fallen out of a hole in your old brown overcoat — true, they never said your name. But I knew just who they meant. Especially when they said it really loud, said it on the air, and said it on the radio. This’ll be the second part of a transcript I started many months ago (you can read the first part here) documenting a time in those blessed early days of 2014 when The Viper & His Famous Orchestra were broadcast over Marconi’s infernal wireless invention from the studios of WMSE 91.7. In the gathering place by the waters, Milwaukee, Wisconsin, hosts Erin Wolf and Cal Roach welcomed us to their Local/Live program one evening of a February 11: we played, we talked, we spun some vinyl. On the radio. You can stream the whole show below this paragraph, or download it as an mp3 podcast at this link. And below the really large picture, I’ve also broken out the songs we played into single-serving chunks, along with a text rendering of the interview half of the program. It gets pretty pretentious/portentous pretty quick, so if you’ve got a hat, hold on to it. 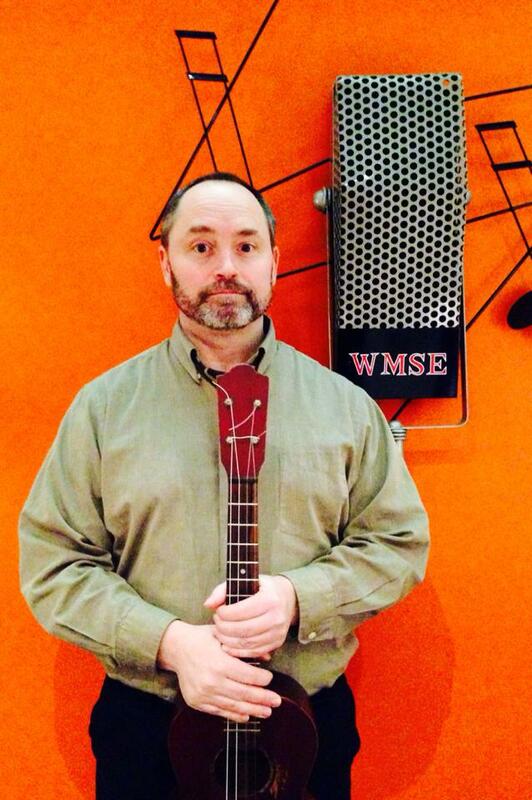 WMSE – The “M” is for me! ERIN WOLF: All right! You have it here. That was “The Yodeler’s Christmas” from Viper & His Famous Orchestra, live here in the WMSE studios. That was pretty great! We heard, going back, “Yodeler’s Christmas,” “Heartbreak for Beginners,” “Hotzeplotz Calls,” “Ukulele Rhythm.” And there you have it. The boys are gonna be in here in just a moment to chat about their music with us. So hang on tight: keep it tuned here to WMSE. EW: All right! We are back. And, ah, we have The Viper himself, and His Famous Orchestra here in the WMSE studios. How are you guys? THE VIPER & HIS FAMOUS ORCHESTRA: (overlapping) We are good! Great. Yes. Rhubarb. Rhubarb. Thanks. CAL ROACH: You guys want to go around and introduce yourselves for our audience? 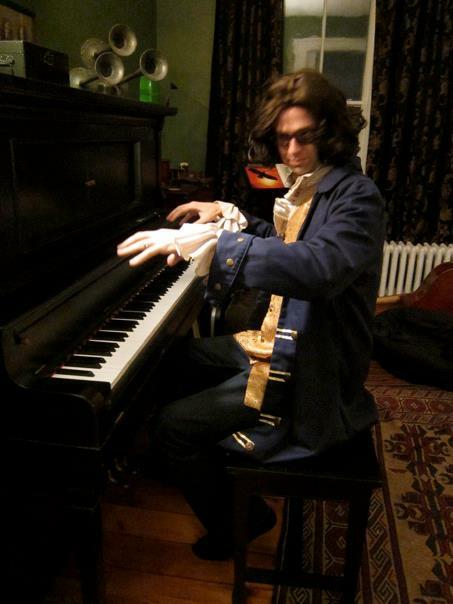 JOHN PEACOCK: I’m John Peacock, and I play miscellaneous keyboards and percussion in the group. RH: I’m Rob Henn, and I play trombone, and backup singing, and jug, and other things. RILEY BROACH: I’m Riley Broach. I play bass, and violin, and sing sometimes. TV: I’m the Viper; I just sort of take credit for what the rest of them do. JP: Rides on our coattails. TV: I should say we have one member who’s not with us today. John is our kind of utility infielder. He can play anything, and does. JP: We’ve left an empty seat. RH: We’ve forgotten you utterly and we’re just… here. EW: Soaking it all in. TV: So it means you don’t get to hear a lot of John’s handclapping skills, which are his real, his main instrument in the group. JP: But it’s also difficult to see my dance moves over the radio as well. So it’s a loss all the way around. TV: He and I are going to start learning — we’re going to learn tap, right? JP: That is the plan, yeah. TV: Incorporate some of that into the band — mad hot ballroom. JP: These are things to look forward to. TV: Works very well on the radio. CR: There’s a lot of sound coming from tap shoes. THE VIPER: Thanks for having us in. CR: Oh, absolutely. It’s our pleasure. Who is this Viper character? Where did that come from? TV: The Viper comes from exactly where you wouldn’t want him to come from. So he comes from a Tiny Tim album. TV: And it’s a routine that he does — which is actually an old joke, and you know it from G.I. Joe, or from camp. The Viper’s going to be here in seven days, then the Viper’s going to be here in seven hours, and he finally gets there and it’s the Viper: he’s come to vipe your vindows. CR: Ah! Yes. I do recall that from summer camp years and years ago. TV: And it’s also a bit of 1940s jazz slang as well. EW: That is good to know. CR: And knowing is half the battle. ERIN WOLF: Yeah. Very cool. So, we want to know — for the audience’s sake too — what is skiffle, exactly? And are you guys trying to steal the term back from pre-British-Invasion-era UK revival, and are there any specific skiffle artists you would call major influences? THE VIPER: Umm, I think I discovered skiffle after we’d already been playing for a while. So it’s like calculus or photography: it was sort of invented twice. TV: Mostly skiffle, the idea of it is you make do with what you have. Right? And it’s sort of… you can see why it’d be a very post-War British style of music. And it led into rock: you know, a lot of the people that you think of as the British invasion bands started their careers as skiffle bands: The Beatles were the Quarrymen, and Jimmy Page was in a skiffle band, and things like that. It only, in Britain, lasted for about four years. And you can get every single skiffle recording on a two-disk set — I’m not going to tell you where to get it, you know, or encourage you to get it. I’m just saying you can get it. .
Actually, you can get it right here! 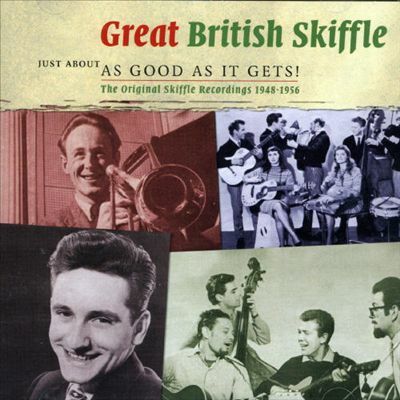 The compilation is a 2-volume set called Great British Skiffle: As Good as It Gets! There wasn’t that much recorded. It included one American, a guy named Alan Lomax, who was a big folklore collector from the U.S. but he was, during the McCarthy era, was in England, uh, avoiding the hammer and had a skiffle group there, too, that did some recordings. I think Peggy Seeger was in his group and things like that. But it basically: homemade instruments: suitcases, jugs, you know, then whatever else you had around. Banjos. It’s why John Lennon played banjo to start with, and why Paul McCartney had to teach him how to tune his guitar like a guitar instead of like a banjo when they started playing together. Various things: it was sort of a loose amalgamation of things that British people thought sounded American and old-timey. Country, jazz, and folk. So things that we think of as very much separate strains were pulled together in this style because they didn’t know any better. They didn’t know that if you were country you weren’t supposed to also be jazz. One of my favorite skiffle performances: here’s the Skiffle City Ramblers in a very strange Soviet-era clip. Watch for the amplified & muted mouth trumpet solo! EW: So is the Beatles song “Honey Pie,” would that be considered skifflish? TV: That’s… well, that’s more music hall. But we do that, kind of. I mean, really, I used to call us vaudeville, and then I used to call us music hall, and then I settled on skiffle, because less people knew what it meant, and then I could define it however I wanted. TV: …right? Is, sort of, probably something that’s closer in that vein, if you can imagine it played on acoustic instruments. TV: That kind of beat. 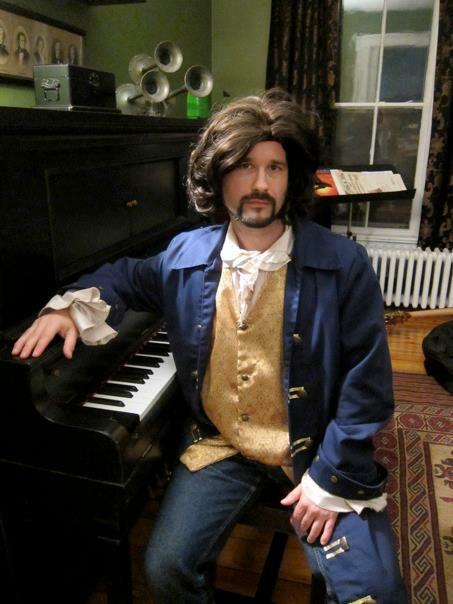 CAL ROACH: Your bio says that you write songs in the Key of B-flat. What’s so special about B-flat? THE VIPER: Well, Rob, you tell us that. ROB HENN: It’s also the key that the trombone is in. CR: Ah hah! Interesting. That’s key. RH: But really, there’s nothing special about it whatsoever. Especially in our songs, there’s nothing special about it. TV: It just sounds good in a description. We should all live in B-flat. If you can’t be natural, be flat. CR: (sarcastic laughter) We’re all slapping our knees here. ERIN WOLF: I thought you were just taking cues from Stevie Wonder, too. Songs in the Key of Life. CR: B-flat is the key of life. RILEY BROACH: Wasn’t Homer Simpson’s quartet the B-sharps? TV & HIS FAMOUS ORCHESTRA: Yes! ERIN WOLF: That’s awesome. So, the suitcase being played as a drum. And you have a stylophone. I mean, I have so many questions regarding these things. But the ultimate question is: How many suitcases have you guys gone through? Playing the suitcase as percussion, I can imagine it takes quite the beating. Sketch of typical vintage suitcase for percussive purposes. THE VIPER: Yeah, you can’t play, like, the vinyl coating, those don’t work. JP: Yeah, yeah, yeah. And then there’s got to be a hipness factor as well, you know. The guitar, you know, is 50-percent cosmetics, you know. But, ah… Yeah, so I don’t know. 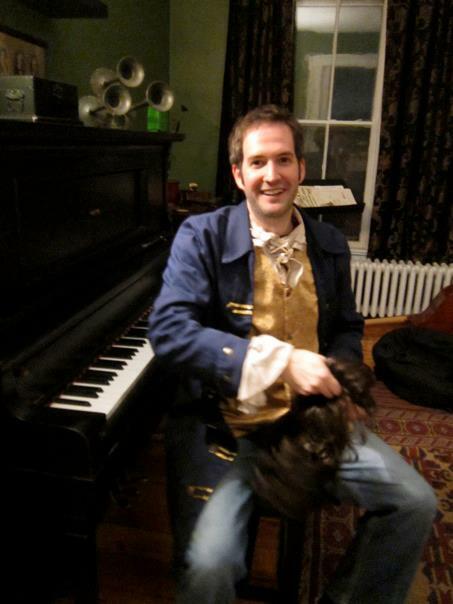 Edward is our sort of founding suitcase player. But there’s been various people playing suitcase in the band throughout time: Edward’s been the one constant. TV: We’ll mention Kevin Carollo; we’ll mention Victor Cortez. JP: And at times, we’ve had as many as three people playing suitcase onstage. And we’ve talked about getting an entire luggage set, perhaps, for the group. ROB HENN: We had a song called “The Suitcase Boogie” — R.I.P. JP: But, yeah, there have been many, many suitcases in the band, and many things that have struck them as well. I first saw it, I think, in the Dustin Hoffman movie, Lenny, the Lenny Bruce bio-pic. And there’s just one scene that lasts about two seconds, where they’re in a hotel room at a party, and there’s a jazz band playing, and the drummer is playing on a suitcase with some whisk brooms and a piece of newspaper over the top of it to give it more of a snare sound. And I thought: A ha! So that’s a thing! And then I found — same with skiffle — I found afterwards that this was a thing. 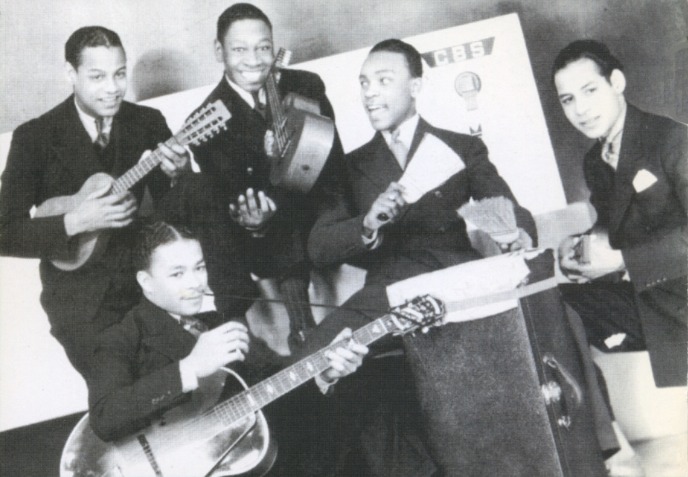 That there were… there was great band from the 30s called The Spirits of Rhythm, who played tiple, which is a ten-string ukulele, and then they also had a suitcase player who was quite good. JP: It’s great showing up to a gig and just having to carry a suitcase. You know, especially as a drummer, you know, not having to lug eight trips to the car with hardware and things like that. So I can haul the suitcase and have my stylophone and other miscellaneous toy instruments inside of there. So it’s a good deal for all. 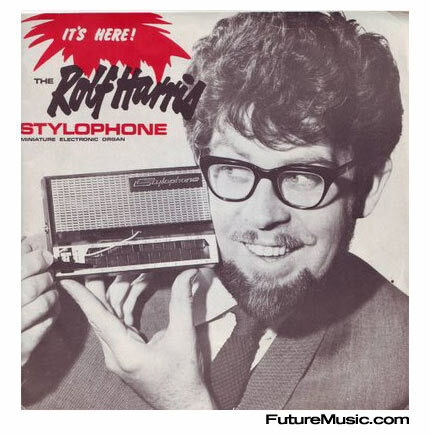 CAL ROACH: Can you give a little description of how the stylophone works, exactly? But yeah, ah, about ten, fifteen years ago there was a warehouse that was found that had a bunch of new old stock so I read an article about it and that’s what got me into the stylophone. But it’s a little metallic keyboard and you have a little stylus that’s connected with a little wire. It looks like I’m playing a DS or something like that. THE VIPER: Or a transistor radio. That’s what it kind of looks like to me. JP: What kind of people do you think are listening to this show, Ryan? But, ah, yeah and so, I have all these kind of weird instruments that never really get used for much. And so when I get called to a Viper rehearsal, which would usually be about fifteen minutes before the gig, I would just show up with a tub full of stuff. And the stylophone sound really spoke to Ryan, so it was great for me to bust out my stylophone collection. RILEY BROACH: We didn’t bring the bass stylophone, though. TV: That one is nice. 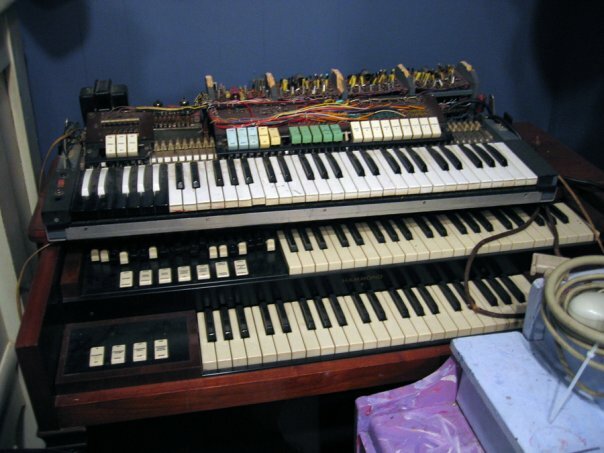 It has a very kind of Farfisa organ sound to it. And it can play the part of the trombone, it can play the part of a steel guitar. JP: Well we’re working Ryan out… we’re working Rob out of the band. But, ah, by a bit it’ll be all stylophone. It is the future! TV: And, like I said, the song people will know it from is [David Bowie’s] “Space Oddity.” You know, I think. And there are people that play it now. You can find plenty of people who play it on YouTube and things like that. JP: But none quite like this. TV: Don’t necessarily go there. I’m just telling you that they’re playing their stylophones. Rolf Harris, the Australian folk superstar, the guy who wrote “Tie Me Kangaroo Down, Sport”… I think you have some of these records, right? He did instructional…? JP: You know, it’s like putting your name on the box of something — I’m trying to think of a modern reference of that. TV: He was serious though. He did, like, four-piece stylophone songs…? See the four-piece stylophone song! With Rolf Harris! JP: But, yeah, his face is on all the old boxes. CAL ROACH: So I read that your first album was produced by Jay Bennett. CR: And how did you connect with him, initially? How did that come about? Jay Bennett mixes Everything for Everyone while The Viper and His Famous Orchestra look on. TV: It is out there, right? It’s quite good. So, he’d seen us play. And it’s very different from what he does. He’s known for, in Wilco, being the guy who tweaks everything and gets in and does bits and pieces and constructs these soundscapes out of little bits and things. And I think it was a nice vacation for him to just set up a couple mics in front of us and record us, and then just sort of work afterwards to try to figure out what he wanted it to sound like as the kind of soundspace. RILEY BROACH: Hundreds of guitars. …hundreds of guitars that they hoarded and drove up the price of vintage guitars, you know, throughout the early aughts with. RH: Hammond. It was a Hammond. Yeah. Which one is that on? TV: Yeah, on Everything for Everyone, on a song called “Pretty Is As Pretty Does,” which is by a Champaign-Urbana songwriter named Angie Heaton, he plays some Hammond organ on that, and it’s quite lovely. ERIN WOLF: That is really cool. EW: Is it just a convenient tune to parody, or do you feel a particular connection to the narrative. TV: Yeah. I think I started doing… a lot of my songs that I write come out of just learning another song, and then deciding – why bother to cover this, I could just write one pretty much like it. And so, this goes… I played at my mom’s 40th high school reunion in 2002… No, that must have been 1992. When was… I don’t even know. Doesn’t even make sense. ROB HENN: Careful there! I don’t know if your mom wants this out. TV: So I learned all these songs from 1962. And, know, The Music Man came out that year, I think, as a movie. And so I learned “Trouble” — I love that song, I’d been in The Music Man as an eighth-grader, in the barbershop quartet. And then I also happened to be reading Marx’s Das Kapital that same summer, and I thought: this would be a good book to boil down to its three-minute version, and then put in the mouth of a shady character who speaks truth despite himself. And so that’s what that particular mash-up is doing. The viper’s well-worn copy of Karl Marx’s Capital, vol. 1. Just look at those fat cats! CAL ROACH: Match made in heaven! 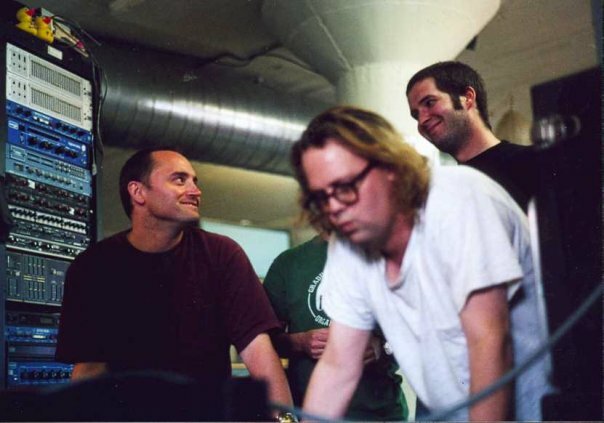 CAL ROACH: One of ’em, the one that really struck me was… opens the album, the cover of “Dance of the 7 Veils” by Liz Phair. CR: What was the inspiration behind that one? TV: …without getting in trouble for it. TV: …which I did, and a few of the songs stuck around for awhile, and that was one of them. I really liked it. And I like the way it sort of… A lot of ukulele players run as far as away from Tiny Tim as they can, but I love Tiny Tim, and I love the work he does with Richard Perry and the sort of… the collage of cultural elements that they throw together and make work, I think, in really interesting ways. And I like… that was sort of my homage to Tiny Tim’s way of doing things like “Nowhere Man” by the Beatles, or “I Got You Babe.” So that’s the closest thing we do to sounding like Tiny Tim. And I thought it was nice in the context of a Liz Phair… very dirty Liz Phair song. ERIN WOLF: It’s a refreshing version. CR: Ever hear any feedback from Liz? TV: No, I have not. CR: No? That’s too bad. I’m sure she’d enjoy it. ROB HENN: We’re out there trying to promote her. And is she grateful? No! TV: Not “promoting her,” promoting her. CR: She does exist. She does exist. She’s out there. RH: …spreading the word of her existence. ERIN WOLF: So I was doing a little bit of reading up on you. You are a professor. 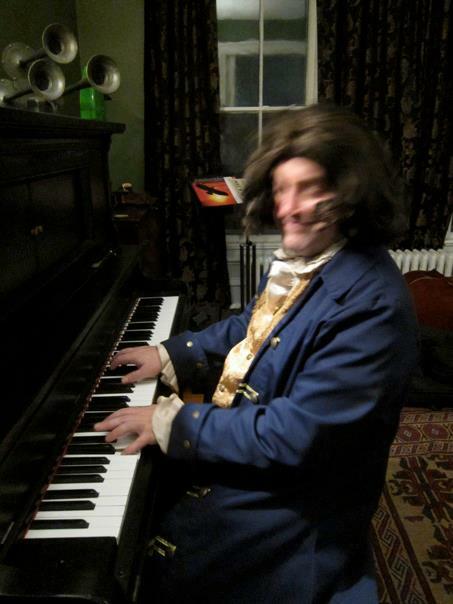 You’ve written things about history, of our musical history, jazz musical history. Jerving, Ryan. “Early Jazz Literature (And Why You Didn’t Know).” American Literary History 16, no. 4 (Winter 2004): 648-674. Jerving, Ryan. “Jazz Language and Ethnic Novelty.” Modernism/Modernity 10, no. 2 (April 2003): 239-268. Jerving, Ryan, “An Experiment in Modern Vaudeville: Archiving the Wretched Refuse in John Howard Lawson’s Processional.” Modern Drama 51, no. 4 (Winter 2008): 528-555. EW: And also, you teach ukulele. 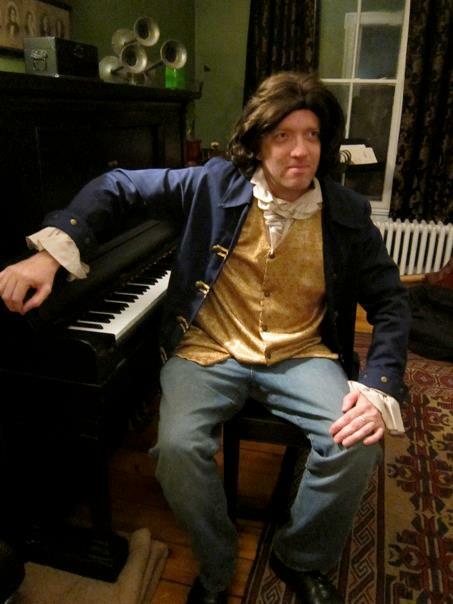 I guess I wanted, since we’re a little bit short on time, more so, want to talk about you as a teacher of music. Because I’m curious to know, how long, generally, does it take someone to learn the basics of the ukulele? THE VIPER: Ukulele is a very easy instrument to learn the basics of. And you can, within a few weeks, be playing well enough to strum along and accompany yourself on “Iko Iko” or “Jambalaya” or some other two-chord song like that. TV: The kind of music that’s written, that’s sort of written for ukulele, or special for ukulele, all the Tin Pan Alley and stuff like that, turns out to be kind of surprisingly complicated. There’s a lot of chords, right? TV: You don’t have these leftover strings to try to figure out what to do with like you do with a guitar. EW: Right, and I’m imagining, like, between, you know, that and teaching mandolin, which has, you know, a few extra strings, ukulele’s probably more popular with giving lessons, because of its ease? TV: Yeah, because mandolin is a more melodic instrument, so people who play that want to sound like a bluegrass player, right? TV: But ukulele you can really just kind of strum and sing, and it’s great instrument for that. TV: And that’s why it was as big as it was in the ’20s and why it was as big as it was in the ’50s, because it was very much an at-home instrument. EW: Easy to pick up. TV: You can play it laying down. EW: After a big meal. JOHN PEACOCK: Play it all over YouTube. ROB HENN: Put some gasoline on it, light it on fire, do the Jimi Hendrix kind of thing. TV: Well, actually, I started playing ukulele because I wanted to smash things on stage, and I didn’t want to smash my guitar. And I smashed about four ukuleles, and stopped. I tried to burn one on stage, but it’s treated with some kind of chemical — hard to do that with. EW: Yeah, they’re usually pretty shiny. TV: So I started playing that one. RILEY BROACH: While it was burning? CR: Ukuleles are cheap. Hooray! TV: They were then. Honestly, ukuleles were $20 when I was smashing them. That’s not the way it is anymore. CAL ROACH: Before we send you guys back out to play another set. Just wondering: you haven’t… It’s been since 2004 since you guys have put any recordings out. Any plans for anything any time soon, as far as recordings? JOHN PEACOCK: Making the band sound like they’ve never sounded before, and never will again. ROB HENN: Which is to say: good! ERIN WOLF: Cool. That inspired you. I mean, honestly, that was the first time I’ve seen you, and you kind of blew my mind, too, with the Violent Femmes cover that you threw in there. Um, did you? TV: Because he had just died. EW: Why did I think it was Violent Femmes? TV: They were big, you know, I was in high school in the ’80s, they were a big influence on me, they’re why I like drummers who stand up and play things that aren’t drums. EW: It made an impression, nonetheless. And I was, like, “where did these guys come from?” So that’s exciting to hear that you’re taking that Neil Young experience and making a recording with it. EW: So aside from recording, you guys are playing… the next gig you have – you recently played the Sugar Maple – you’re playing… is it at a library? TV: Yeah. Well, actually, the next show we’re playing is at a house show in Springfield, Illinois. According to advanced sales, there may be as many as 7 people there. JP: I will not be one of them. TV: March the 7th. It’s a Friday night. EW: What time does that…? TV: It’s a beautiful space. EW: Oh, it is. Yeah. TV: We’ll start at, I think, 8:15. EW: Ok. Cool. So, that, it’s an amazing stage, too. So, I think, many people might not know that the Anodyne in Walker’s Point does have a stage. TV: Yeah, I think that they’ve only recently started having music. CR: I didn’t know that. EW: Yeah, so, they’re on Bruce Street. So 8:15, The Viper and His Famous Orchestra will take the stage there. Are you going to… I think they have a piano. Are you going to utilize any of the accoutrements? TV: …add some Fessnicity to the proceedings. Riley Broach gets in his Anodyne mental space. EW: All right. Cool. Well, looking forward to it. Well, we’re going to send you back out, and you guys are going to kick it off with “Speakin’ Out.” So we’ll let you get to it. EW: All right. The Viper and His Famous Orchestra on their way back out to the studio. We’ll be right back with them again, live. ERIN WOLF: Well, thank you once again to Ryan Jerving, The Viper, and His Famous Orchestra for coming in today to talk about the music and play some tunes, live. And, again, their next show here in Milwaukee is at the Anodyne on Bruce Street, and that is March 7th, at 8:15. And they’re going to play three more songs for us. I’m going to let ’em get to it without further ado. From the Bob and Genie Friedman live studios here at WMSE: The Viper and His Famous Orchestra. https://viperblog.files.wordpress.com/2015/11/speakin_out.mp3Right click to download the mp3. THE VIPER: Rob Henn, I’d like you to pick up that jug over there,. and play on it a little bit. This song is called “I Got the World in a Jug (and the Stopper in My Hand).” Radio listeners at home, you all know how to play the jug, don’t you? You just put your lips together and blow, and it sounds something like this. https://viperblog.files.wordpress.com/2015/09/world-in-a-jug-and-the-stopper-in-my-hand.mp3Right click to download the mp3. ERIN WOLF: All right! That was The Viper and His Orchestra. Very, very cool stuff. “Stopper In My Hand” was the name of that track, featuring music from the Viper, and jug playing, and some trombone, and what have you. EW: So they’re going to come back in, and we’re going to get into the “This Is Your Song” segment. We’ll be right back. And with that, we come to the end of Part 2. There is a short coda-like pt. 3 to come, featuring The Viper’s DJ song pick and some closing thoughts. Stay tuned!